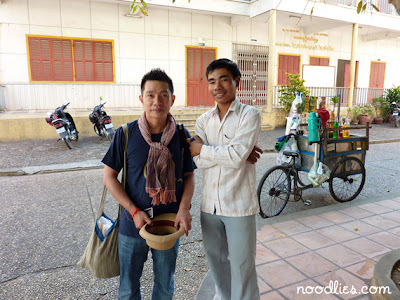 I met Thong in the grounds of a temple in Phnom Penh. He’s Vietnamese and has been living in Cambodia for a few years with his mother. They come in search of a better life. He pushes a cart around (in the background) selling cups of Vietnamese iced coffee, made with cheap grade coffee and sweetened with condensed milk. He stops by this temple every morning and afternoon to serve the Monks who generally should stay inside the temple grounds. They say his coffee is the best around. Thong is in his 20s, his face already darkened, aged and sun damaged. But he has an optimistic, joyful attitude towards life, despite the hardship. He was so happy to meet another Vietnamese and we usually chat when we meet on the temple grounds. On the day before I left Phnom Penh, he wouldn’t accept payment for the coffee, it was the only gift he could give a friend. He began to cry and said he hoped we would meet again if it was our karma. I was so touched by his kindness and care for someone he’s only met a few times and who’s situation in life is so much more comfortable than his own. I tried to give him an equivalent of around A$20, a modest amount, but worth god knows how many iced coffees. Proud Thong was so happy but wouldn’t accept. His voice croaky, his eyes still teary, he kept on saying ‘but our friendship is enough, my brother Thang’. I often think of this wonderful soul and send him kind prayers. At the same time, I shed a few tears of gratefulness for my situation and for having met, although briefly, such beauty and unconditional kindness. What a wonderful post about a wonderful person. It was so emotional made me shed a tear too. Still getting through all your summer posts but this one is really lovely and touching. I really hope our karma will allow us to see each other again. Thanks Julie, but as you probably know, you meet these people and we have a kinda word for it in Vietnamese called 'bui doi' usually has a nasty connotation, but not for Thong, it means dust of life..
they get blown here and blown there.. and you just don't end up seeing them again.